It was a lovely long bank holiday just gone, made longer because it was the Queens jubilee. 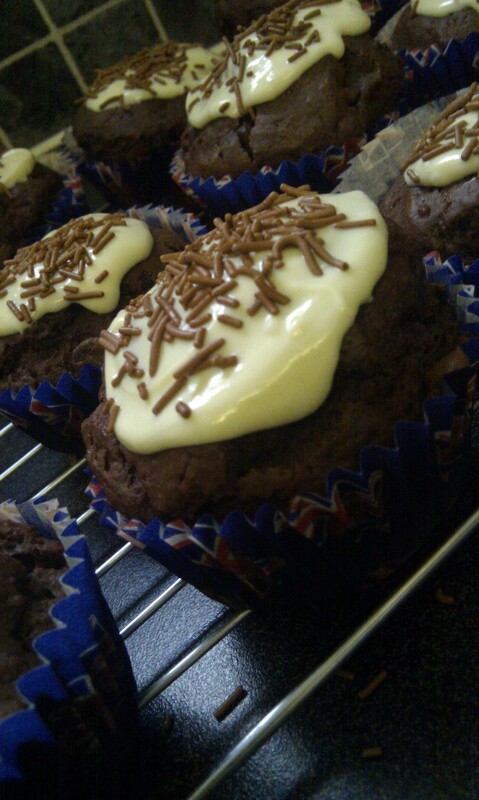 Although we didn’t really celebrate it in our house, it did give me chance to use my Union Jack (flag – if you want to be technically correct as we’re not at sea) muffin cases; so made some chocolate muffins with white chocolate topping and chocolate sprinkles. As my sister, her fiancé and her friends were down to visit I thought these would be a nice snack for them whist they watched England play football – which we were celebrating. I just used this recipe I have posted here and then made a very simple white chocolate topping by melting white chocolate and mixing in a couple of teaspoons of icing sugar till it became slightly thicker. When set, it meant it wasn’t too hard to eat, like it does when you just put just melted chocolate on the top of a cake. I had a little experiment because I didn’t have any double cream in the fridge so I tried out a couple of things to make the chocolate stay soft-ish. All of them were a disaster except for the icing sugar. I tried mixing butter and a small drop of orange essence into the white chocolate but this split the mixture, making a very nasty looking mix of butter with white bits floating in it. Then I tried adding a little light corn syrup. Nope, this didn’t work either, it set solid instantly! Although it did have the effect (which I had forgotten I had originally imported it from America in the first place) of making chocolate paste – but that is for a different post when I get time to play around and perfect it. Finally I thought I would add the icing sugar and that worked a treat. I would recommend it if you need a very quick and easy to make topping for your cake which sets quickly and smoothly. Note that if you do want to put sprinkles onto it or other decorations, it does set pretty quickly so put the chocolate on followed straight away by the decorations then move onto the next cake. The chocolate stays warmer in the bowl it was melted in but you do need to work reasonably quick so get everything ready before you start. Did anyone else get round to doing some Jubilee or bank holiday baking? Previous postFoccacia – a bread anyone can make, even me!